I was in Walgreens the other day and remembered that I wanted another ear wash bulb in case I wore the one I already had, out. I had been thinking about constructing some sort of nasal washer thing out of a submersible pump or syringe with surgical tubing or something like that. What a pain to have to do. I made my way over to the pharmacy section and found some baby nasal bulbs that looked OK, so I bought them. They weren’t really like my other bulb, the nozzles were short and didn’t extend past the nostril. I will be returning them, unopened. Anyway, that’s when the thought came to me that I might find some sort of better solution for flushing my nostrils of the poison toxic gasses. I looked behind me opposite the bulbs and saw all sorts of nasal stuff. At the very bottom of the shelf, I see this nozzle looking thing in a rather large box. I then look at the price tag and it is reduced to $28. More interested now, I take a closer look and see that there is some sort of machine attached to a nozzle, the box top proclaiming it a “Nasal Wash”. I pick it up and try to open the box but it is taped shut. I then take all of the boxes off the shelf and grab the last one, I figure I may as well give it a try since squeezing the bulb is becoming really tiresome. In the car I open the box and am pleasantly surprised that it is in multiple parts and requires assembly. I quickly put the pieces together and am again surprised that it seems well made, it even came with three Duracell AA batteries. I re-box it and drive home. I didn’t put the batteries in until I had water in it, I know that running pumps while dry does damage. I was even more surprised that the battery cover has a little rubber seal that goes all the way around it and a “slide to lock” mechanism too. Even the start button is sealed with a rubber cover, you don’t have to worry about getting it wet. The sound it makes is reminiscent of a “Water Pick”, remember those? I always thought a “Water Pick” was much better suited to blasting ear wax out of your ears, far less messier than shooting your teeth anyway. It does deliver a rather large stream of pulsed water. I put it up to my nose and press the rubber covered button. Two seconds later, a steady stream of water is flowing out of the opposite nostril, I can smell the familiar chemical smell begin to emanate and fill my mouth. Now that I have a steady stream coming out of the other nostril, collecting samples in the morning will be a snap (for later GC/MS analysis). It works so much better than the blue thing above! I no longer have to fumble with the bulb, just quickly unscrew the blue solution reservoir, hold under running water till full, screw back on and flush. The instructional video tells you to use either filtered or distilled water, probably because the minerals in regular tap water will shorten it’s pump life. I use way too much water for my flushing, so I just keep the tap running and fill as needed. The detached reservoir works great as a “drinking” cup to swish your mouth out with and to rinse the sink clean of the boogers blasted into it as well. I love this thing! The Sinugator goes through it’s little blue solution reservoir of water very fast, I use one whole cupful for each nostril. After a particularly heavy toxic gas exposure, I use anywhere from four to six cupfuls, alternating between each nostril per filling. It is easy to use and seems well built, I have yet to use the saline however. If your nasal passages are already swollen, be prepared for your ears to pop from the pressure. The Sinugator really is low pressure as advertised but it also has some force and will keep right on pumping even though it’s nozzle is blocked. Should it encounter blockage due to your swollen nasal canal, it can cause some unpleasant pressure and make your ears “pop”. You can also blow your nose with the free nostril while the Sinugator is helping, but only if you don’t have too much blockage. Your ears will REALLY pop if you blow while blocked (swollen canal). Blowing while irrigating will stop the flow and may cause some backwash into the device, but you are the only one who is going to be using it, right? It breaks down and is able to fit into the small little net bag complete with saline packets, just add your own water. I have yet to take it with me outside of the house but I do get dosed outside too, so it will come in handy when that happens. It is rather loud so you won’t be able to hide while using it, people will look and stare. I don’t care, just another opportunity to hand them a blog card explaining why I am doing what I am doing. If in a touristy area and they want to film it, so much the better. Little teapots with long spouts have become a fixture in many homes for reasons that have nothing to do with tea. Called neti pots, they are used to rinse the nasal passages with a saline (salt-based) solution, and have become popular as a treatment for congested sinuses, colds and allergies, and for moistening nasal passages exposed to dry indoor air. However, the Food and Drug Administration (FDA) has concerns about the risk of infection tied to the improper use of neti pots and other nasal rinsing devices. 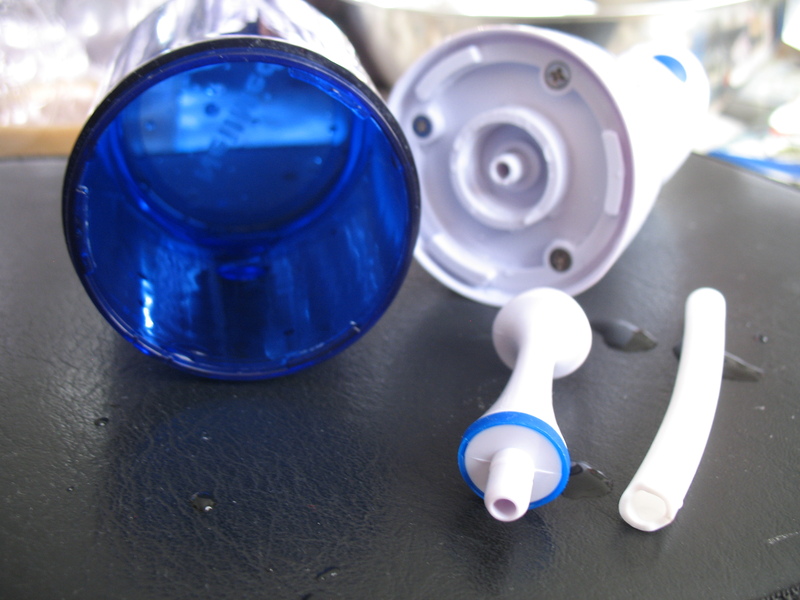 The agency is informing consumers, manufacturers and health care professionals about safe practices for using all nasal rinsing devices, which include bulb syringes, squeeze bottles, and battery-operated pulsed water devices. These devices are generally safe and useful products, says Steven Osborne, M.D., a medical officer in FDA’s Center for Devices and Radiological Health (CDRH). But they must be used and cleaned properly. Most important is the source of water that is used with nasal rinsing devices. Tap water that is not filtered, treated, or processed in specific ways is not safe for use as a nasal rinse. Some tap water contains low levels of organisms, such as bacteria and protozoa, including amoebas, which may be safe to swallow because stomach acid kills them. But these “bugs” can stay alive in nasal passages and cause potentially serious infections, according to the Centers for Disease Control and Prevention (CDC). Information included with the device might give more specific instructions about its use and care. However, FDA staff has found that some manufacturers’ instructions provide misleading or contradictory information, or lack any guidelines. For example, some manufacturers have recommended using plain tap water; others warn against using it in printed directions, but show its use in pictures or videos. The device might also come without instructions. If you order a custom neti pot made by an artist, for example, that person might assume you know how to use it. Clear your nostrils, then repeat the procedure, tilting your head sideways, on the other side. 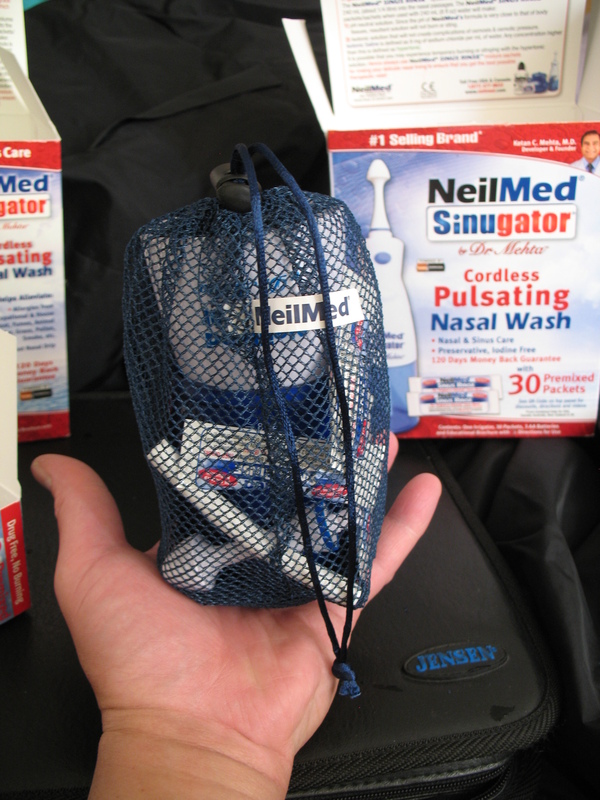 Nasal rinsing can remove dirt, dust, pollen and other debris, as well as help to loosen thick mucus. It can also help relieve nasal symptoms of allergies, colds and flu. “The nose is like a car filter or home air filter that traps debris. Rinsing the nose with saline solution is similar to using saline eye drops to rinse out pollen,” Osborne says. The saline, he adds, enables the water to pass through delicate nasal membranes with little or no burning or irritation. FDA staff recommends that you consult a health care provider or pharmacist if the instructions do not clearly state how to use the device or the types of water to use, if instructions are missing, or if you have any questions. What types of water are safe to use in nasal rinsing devices? Boiled and cooled tap water—boiled for 3-5 minutes, then cooled until it is lukewarm. Previously boiled water can be stored in a clean, closed container for use within 24 hours. Water passed through a filter with an absolute pore size of 1 micron or smaller, which traps potentially infectious organisms. CDC has information on selecting these filters, which you can buy from some hardware and discount stores, or online. How do I use and care for my device? Use the appropriate water as recommended above to prepare the saline rinse, either with the prepared mixture supplied with the device, or one you make yourself. Wash the device with distilled, sterile, or boiled and cooled tap water, and then dry the inside with a paper towel or let it air dry between uses. Are nasal rinsing devices safe for children? Some children are diagnosed with nasal allergies as early as age 2, Osborne says, and could use nasal rinsing devices at that time, if a pediatrician recommends it. However, he adds that very young children might not tolerate the procedure as easily as would older children or adults. What are some negative effects to watch out for when using nasal rinsing devices? FDA asks health care professionals and patients to report complaints about nasal rinsing devices to the FDA’s MedWatch Safety Information and Adverse Event Reporting Program. This entry was posted in Product Reviews by Eldon J. Brown. Bookmark the permalink.